↑ Ehrenfest, Paul (1920). "How do the fundamental laws of physics make manifest that Space has 3 dimensions?". Annalen der Physik. 61 (5): 440. Bibcode:1920AnP...366..440E. doi:10.1002/andp.19203660503. . Also see Ehrenfest, P. (1917) "In what way does it become manifest in the fundamental laws of physics that space has three dimensions?" Proceedings of the Amsterdam Academy20: 200. ↑ Weyl, H. (1922) Space, time, and matter. Dover reprint: 284. ↑ Tangherlini, F. R. (1963). "Atoms in Higher Dimensions". Nuovo Cimento. 14 (27): 636. ↑ Tegmark, Max (April 1997). "On the dimensionality of spacetime" (PDF). Classical and Quantum Gravity. 14 (4): L69–L75. Bibcode:1997CQGra..14L..69T. arXiv:gr-qc/9702052 . doi:10.1088/0264-9381/14/4/002. Retrieved 2006-12-16. Barrow, John D.; Tipler, Frank J. (1988). The Anthropic Cosmological Principle. Oxford University Press. ISBN 978-0-19-282147-8. LCCN 87028148. Cirkovic, M. M. (2002). "On the First Anthropic Argument in Astrobiology". Earth, Moon, and Planets. 91 (4): 243–254. doi:10.1023/A:1026266630823. Cirkovic, M. M. (2004). "The Anthropic Principle and the Duration of the Cosmological Past". Astronomical and Astrophysical Transactions. 23 (6): 567–597. Bibcode:2004A&AT...23..567C. arXiv:astro-ph/0505005 . doi:10.1080/10556790412331335327. Conway Morris, Simon (2003). Life's Solution: Inevitable Humans in a Lonely Universe. Cambridge University Press. Craig, William Lane (1987). "Critical review of The Anthropic Cosmological Principle". International Philosophical Ouarterly. 27: 437–47. doi:10.5840/ipq198727433. Hawking, Stephen W. (1988). A Brief History of Time. New York: Bantam Books. p. 174. ISBN 0-553-34614-8. Mosterín, Jesús (2005). "Anthropic Explanations in Cosmology." In P. Háyek, L. Valdés and D. Westerstahl (ed. ), Logic, Methodology and Philosophy of Science, Proceedings of the 12th International Congress of the LMPS. London: King's College Publications, pp. 441–473. ISBN 1-904987-21-4. Taylor; Stuart Ross (1998). Destiny or Chance: Our Solar System and Its Place in the Cosmos. Cambridge University Press. ISBN 0-521-78521-9. Tegmark, Max (1997). "On the dimensionality of spacetime". Classical and Quantum Gravity. 14 (4): L69–L75. Bibcode:1997CQGra..14L..69T. arXiv:gr-qc/9702052 . doi:10.1088/0264-9381/14/4/002. 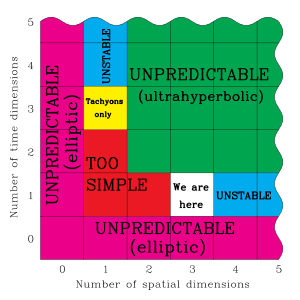 A simple anthropic argument for why there are 3 spatial and 1 temporal dimensions. Tipler, F. J. (2003). "Intelligent Life in Cosmology". International Journal of Astrobiology. 2 (2): 141–48. Bibcode:2003IJAsB...2..141T. arXiv:0704.0058 . doi:10.1017/S1473550403001526. Walker, M. A. & Cirkovic, M. M. (2006). "Anthropic Reasoning, Naturalism and the Contemporary Design Argument". International Studies in the Philosophy of Science. 20 (3): 285–307. doi:10.1080/02698590600960945. Shows that some of the common criticisms of AP based on its relationship with numerology or the theological Design Argument are wrong. Ward, P. D. & Brownlee, D. (2000). Rare Earth: Why Complex Life is Uncommon in the Universe. Springer Verlag. ISBN 0-387-98701-0. Vilenkin, Alex (2006). Many Worlds in One: The Search for Other Universes. Hill and Wang. ISBN 978-0-8090-9523-0. Gijsbers, Victor. (2000). Theistic Anthropic Principle Refuted Positive Atheism Magazine. Stephen Hawking, Steven Weinberg, Alexander Vilenkin, David Gross and Lawrence Krauss: Debate on Anthropic Reasoning Kavli-CERCA Conference Video Archive. Sober, Elliott R. 2009, "Absence of Evidence and Evidence of Absence -- Evidential Transitivity in Connection with Fossils, Fishing, Fine-Tuning, and Firing Squads." Philosophical Studies, 2009, 143: 63-90. Leonard Susskind and Lee Smolin debate the Anthropic Principle. Berger, Daniel, 2002, "An impertinent résumé of the Anthropic Cosmological Principle." A critique of Barrow & Tipler.